PowerPoint found a problem with content C:\Users\mylocation\Desktop\02b Install and Configure TFS.pptx. PowerPoint can attempt to repair the presentation. If you trust the source of this presentation, click Repair. Sorry, PowerPoint can’t read C:\Users\mylocation\Desktop\02b Install and Configure TFS.pptx. After 20 minutes on this hamster wheel I realized that this file came from the internet and is by default untrusted. 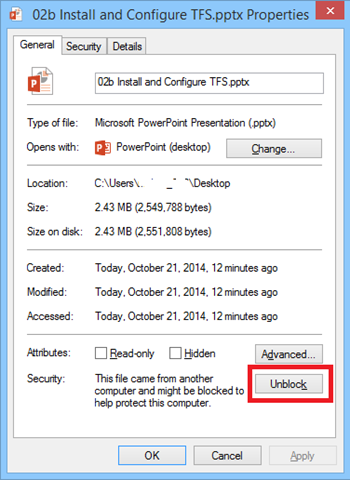 Just right click and under the General tab you will notice an option to “Unblock”, this applies to Office and regular zip files. Ugh!